Initial coverage looked very encouraging. The BBC reported that the Rt Rev’d Christopher Chessun, Bishop of Southwark, had exhorted the House of Lords to pass the European Union (Notice of Withdrawal) Bill un-amended; that for better or worse, in sickness and in health, they should allow the Prime Minister to just get on with it. So promising did this BBC report of the Bishop’s speech (Hansard [Col. 24]) seem that it earned a tweet (and quite a few re-tweets) with epithets of wisdom: Sensible Bishop. Alas, the appreciation was a little premature. Despite the vagaries of the European Union Referendum Act, it was clear that voters understood that they were, in effect, making a decision, not merely expressing an opinion. They did so in sharply differing numbers riven by age, income, qualifications and location. Regrettably, many parts of the country that have most benefited from EU funding voted decisively, if quixotically, to leave. Why, O why did he juxtapose recipients of EU funding (ie poorer areas) with quixoticism? Quixotic: extremely idealistic; unrealistic and impractical; resembling or befitting Don Quixote; impulsive and often rashly unpredictable; actuated or swayed by emotional impulses; foolishly impractical especially in the pursuit of ideals. Ah, these poor, deluded, foolish Brexiteers. I say to the right reverend Prelate the Bishop of Southwark that I am not sure where he got the word “quixotic” from; the decision had nothing to do with tilting at windmills or Don Quixote. Perhaps he was just expressing an anacoluthon. My Lords, the supporters of Brexit have been called many things: ignorant, gullible, naive, uneducated, bigoted—the right reverend Prelate the Bishop of Southwark has added a new one, which is quixotic..
A bishop (Southwark, from the moist, church-emptying end of the Anglican spectrum) called the referendum result ‘quixotic’. 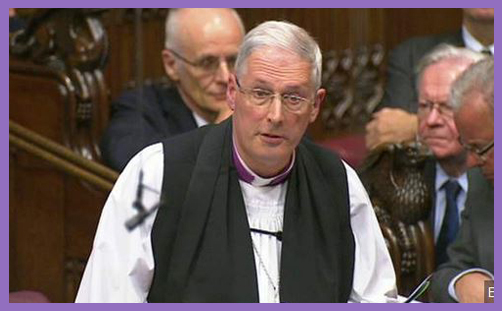 It was almost with a sigh that he said the Archbishop of Canterbury and a majority of the Lords Spiritual had decided to vote for Brexit to be triggered. Others, however, lined up to criticise the government. The Bishop of Southwark said that to ignore the views of those who voted to remain risked creating “regional divide, generational resentment and a threat to the union”. And so, in one fell swoop (actually two snobby sweeps) the Bishop of Southwark clipped the wings of the Archbishop of Canterbury’s new-found Brexit-means-Brexit conviction, and exposed an(other) episcopal hypocrisy: his words flew up; his thoughts remained below. Such people feel frozen out of the post-crash economy, their wages shrinking in real terms while the rich get ever richer. They are routinely accused of xenophobia, or worse, when they express concerns about changes imposed on their com­munities by those who live far away. In the UK, they feel abandoned by the institutions that were formed to represent them: austerity-stricken local government, the Labour Party, and the demutualised building soc­i­eties. ..We then listen to the poor on condition that what they say backs up our own pre-conceived argu­ments. They have become for us an illustration, or a theological idea — anything other than people. The Bishop of Southwark is clearly wedded to his theological idea of Europe, now heaping ‘quixotic’ onto the tired old charges of ‘xenophobic’ (‘racist’, ‘bigoted’, etc). The poor, ignorant, uneducated people who regrettably voted Brexit really must learn better from the episcopal elite, whose antiquated vocation it is to sustain an ancient code of belief, undo a myriad of wrongs, and bring justice to the world.